Retail is a dynamic, fast-paced, and ever-changing industry, but it's not always thought of as a career of choice. The incredible career opportunities are rarely defined clearly, and with the rise in online shopping over the past decade, the role of the store, and its associates and managers have been inaccurately diminished. 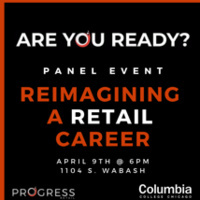 Reimagining a Retail Career will feature an expert panel of retail executives who began their careers on the shop floor, and can speak to what dynamic opportunities exist for growth, travel, and fulfillment, AND speak to what is required to do so. This can't-miss event also includes giveaways, prizes, and incredible networking opportunities. Pre-RSVP will be limited exclusively to students, with general RSVP to the public at a date thereafter. Pre-RSVP attendees are required to complete a short survey to activate their admission to the event. This event is in partnership with Career Center Columbia College Chicago.